It is impossible to understand the flow of refugees emanating from Guatemala, Honduras, and El Salvador—collectively, known as the Northern Triangle of Central America—without understanding the security and economic conditions in each of the three countries. Despite important differences, the three Northern Triangle countries are among the poorest in the Americas and the most violent in the world. Based on statistics from the U.N. Office on Drugs and Crime, or UNODC, Guatemala, Honduras, and El Salvador were three of the five most dangerous countries in the world in 2013—the last year for which U.N. statistics are available. That year, Honduras had the world’s highest per capita homicide rate, at 90.4 homicides per 100,000 people; El Salvador ranked fourth, with a rate of 41.2 homicides per 100,000 people; and Guatemala was fifth, with a rate of 39.9 homicides per 100,000 people. Since then, the situation in El Salvador has dramatically worsened following the 2014 breakdown of a 2012 truce between two of its largest and most powerful street gangs: MS-13 and Barrio 18. In 2015, El Salvador became the most dangerous country in the Western Hemisphere, with a homicide rate of 108.5 per 100,000. This made it 24 times more dangerous than the United States, which had a homicide rate of 4.5 per 100,000 in 2014. The violence in some of these countries’ cities is even worse. For example, San Salvador, the capital city of El Salvador, averaged one murder every hour in August 2015—the highest number of murders since the end of the country’s horrific civil war in 1992.5 The 2015 homicide rates in both Honduras and Guatemala improved to 62.5 and 29.2 homicides per 100,000 people, respectively. To put these numbers into context, other countries in Central America—such as Costa Rica, at 8.5 homicides per 100,000 people; Nicaragua, at 11.3 homicides per 100,000 people; and Panama, at 17.2 homicides per 100,000 people—all had significantly lower homicide rates in 2013. Nicaragua, for example, is the second poorest country in the Western Hemisphere, yet it is far safer than all of the Northern Triangle countries. These safety differentials help explain why some from the Northern Triangle countries are fleeing not only to the United States but also to neighboring countries. From 2008 to 2014, the United Nations documented a 1,179 percent increase in Salvadoran, Guatemalan, and Honduran asylum applications in Mexico, Panama, Nicaragua, Costa Rica, and Belize. From the beginning of fiscal year 2014, more than 120,000 unaccompanied children and an additional 120,000 people in family units—generally mothers with children—have come to the United States. 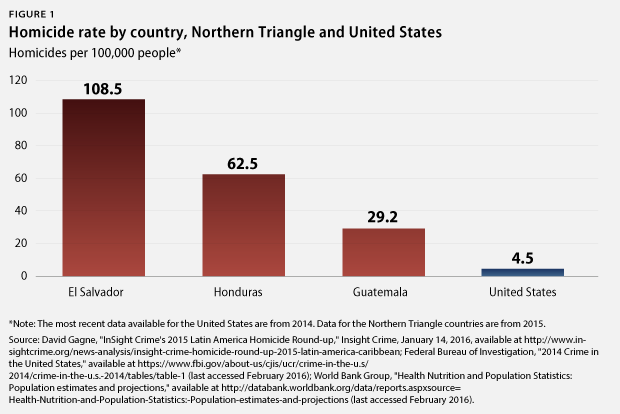 High homicide and femicide rates are not the only indicator of rampant crime and violence in the Northern Triangle. Extortion, for example, is endemic. It is estimated that residents of these three countries pay a total of at least $641 million in extortion annually. The latest available statistics also show a sevenfold increase in kidnapping in El Salvador between 2012 and 2013. These levels of crime and violence across the Northern Triangle did not arise in a vacuum: They are fueled by profound economic insecurity. 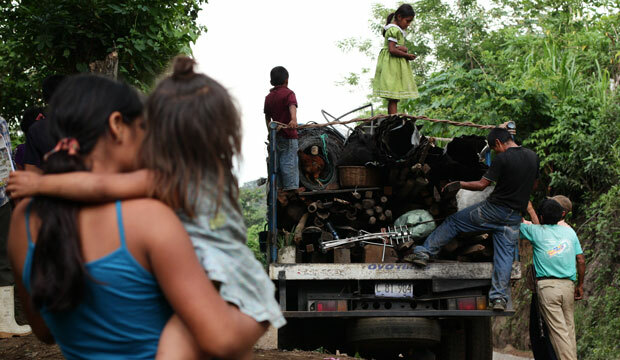 More than 40 percent of Salvadorans live in poverty—and more than 12.5 percent live in extreme poverty. The economic situation is even worse in Guatemala and Honduras. In Guatemala, 54.8 percent of people live in poverty and 29.1 percent live in extreme poverty, whereas, in Honduras, those figures are 69.2 percent and 45.6 percent, respectively. Poverty, however, is not the region’s only economic challenge. Inequality—a longstanding feature of Central American economies—remains staggering across the Northern Triangle. Based on the latest available comprehensive data from 2011, Honduras and Guatemala rank among the bottom 12 countries in the world in terms of their Gini coefficients—a figure used to measure income and consumption disparity—while El Salvador ranks 30th. The rankings place the Northern Triangle nations among countries throughout sub-Saharan Africa, as well as the poorest in Latin America and the Caribbean, such as Angola, the Central African Republic, South Africa, Haiti, and Zambia. The region’s economic challenges are exacerbated by a relative lack of global competitiveness. Guatemala, at 78; Honduras, at 88; and El Salvador, at 95, all rank in the bottom half of the 140 countries examined in the 2015 World Economic Forum’s “Global Competitiveness Index.” Each ranking is weighed down significantly by the business cost of crime and violence, where the countries rank near dead last: Honduras, at 133; El Salvador, at 137; and Guatemala, at 138. Although Central America launched a regional economic integration system in 1993 with the creation of the Central American Economic Integration System, or SICA, effective integration has been hampered by—among other factors—a lack of critical cross-border infrastructure that has held back the region’s global competitiveness. Deeply dysfunctional judiciaries across the Northern Triangle also contribute to the region’s run-away levels of crime and violence, as well as its lack of economic development and competitiveness. Impunity is a fact of life in the region: The vast majority of serious crimes go unpunished by judiciaries that are either corrupt, institutionally incapable of effective prosecution, or both. The inability of courts to administer justice and protect basic rights serves as an enormous deterrent to investment in the region, which could drive expanded economic development. All of these factors—extreme poverty; a lack of opportunity; a dysfunctional justice system; and astonishingly high rates of violence and crime—combine to push children and families out of the region. This report, along with a companion report focusing on short-term recommendations, lay out a comprehensive approach to the Northern Triangle refugee issue. Given the deep roots of the challenges facing the Northern Triangle countries, there is no simple solution—this crisis will not be solved overnight. Thus, this report provides two sets of proposals: medium and long term. The medium-term recommendations focus on refugee processing solutions both in the countries of origin and across the region, giving children and families a place to flee in the region without having to make the dangerous journey to the United States. The long-term recommendations, meanwhile, aim to tackle the root causes of violence, poverty, and insecurity facing the Northern Triangle. These focus on integrating U.S. efforts—within the U.S. bureaucracy and across the Northern Triangle—as well as efforts by the United States and Central America to enhance economic development, promote the rule of law, and target illicit networks. The United States should improve the interview and review process under the Central American Minors, or CAM, program to effectively process and resettle children fleeing the Northern Triangle countries. The United States should conduct emergency evacuations for children at risk of immediate harm and should adjudicate their claims for refugee status and/or parole as quickly as possible. The United States should continue to fund and work with the UNHCR to assist Mexico and Central American countries in strengthening their capacity to efficiently and fairly register refugees, as well as improve Refugee Status Determination, or RSD, procedures. Latin American countries should also partner with the UNHCR to create additional processing centers to assess populations of concern so that more children and families can make it through the system properly and be identified as refugees. The United States should also work with governments and nongovernmental organizations, or NGOs, in Latin America to raise awareness among those apprehended about their right to apply for asylum, as well as strengthen the Latin American countries’ asylum systems. The United States and other countries in the region should provide resources to countries of first asylum—typically, the country where an individual is recognized as a refugee and is protected, yet one that may not always provide a durable solution for resettlement—to promote permanent resettlement and successful integration. The United States should also increase its resettlement quota for Central America and urge other countries, such as Canada, to do the same. The United States and other countries, in partnership with local and international organizations, must support reception and integration efforts for children and families returning to the Northern Triangle. They should also build the capacity of the Salvadoran, Honduran, and Guatemalan governments so that they can effectively provide reintegration support for repatriated individuals. The United States must recognize that fundamental change across the Northern Triangle requires buy-in from regional governments, elites, and societies and should use all available policy and diplomatic tools in order to encourage these groups to focus on meaningful change that promotes citizen security and sustainable economic development. The United States must ensure that all departments and agencies supporting citizen security efforts in the Northern Triangle do so in an integrated fashion. Adopting an enhanced version of the Partnership for Growth, or PFG, launched with El Salvador in March 2011 would facilitate such integration. In addition to bridging bureaucratic divisions, U.S. efforts across the three Northern Triangle countries require greater coordination. The president should formally designate a senior-level special presidential coordinator for the Northern Triangle to accomplish this coordination. The U.S. should also sustain balanced investment in regional efforts to enhance citizen security through the development of robust rule-of-law institutions and equitable economic development. Northern Triangle countries need to ensure that sufficient resources are available for rule-of-law institutions by first redirecting resources currently diverted to private security to the state. Police reform efforts must focus on building police forces rooted in communities from the bottom up. Judiciaries should outsource their most vexing prosecutions through extradition and supranational support for national rule-of-law institutions, at least in the short term. With prisons across the region filled beyond capacity, the United States must work with other international actors—particularly the European Union and the United Nations—that have the resources and capacity to engage on prison reform and management issues in the region. Too often, femicides and domestic violence go unpunished in the Northern Triangle countries. These nations must prioritize the prosecution of these crimes in order to make the countries safe for women and girls. The United States and other nations should help to strengthen civil-society oversight capacity as a means to monitor and hold accountable security, justice, and penal systems. The time has come for the United States to designate for sanctions additional criminal organizations that are responsible for the crime and violence across the region, as well as the wide-scale human trafficking they engage in across the region and into the United States. The United States must also target bulk cash—the lifeblood of many transnational criminal organizations, or TCOs. The U.S. government should, at a minimum, radically reduce—if not altogether eliminate—high-denomination bills. The Obama administration should continue to leverage security cooperation with Colombia and Mexico to benefit countries in the Northern Triangle. Given the importance of the economic development component to a comprehensive approach to enhancing citizen security, the United States must also continue to leverage the Inter-American Development Bank—where it is the largest shareholder—as a source of funding for development projects. Tackling the root causes of violence and structural poverty throughout the Northern Triangle cannot happen overnight. Creating a viable refugee processing solution in the countries of origin and in the region; bolstering the rule of law and citizen security in the Northern Triangle; and targeting TCOs, however, are important places to start. With time—and with a sustained commitment from the Northern Triangle countries, as well as from the United States and other partners throughout the Western Hemisphere—these root causes can be ameliorated. Doing so would give children and families the safety and security needed to avoid attempting the dangerous journey to the United States. Dan Restrepo is a Senior Fellow at the Center for American Progress. Silva Mathema is a Senior Policy Analyst on the Immigration Policy team at the Center.